A friend texted us on Sunday morning: look at the sky! 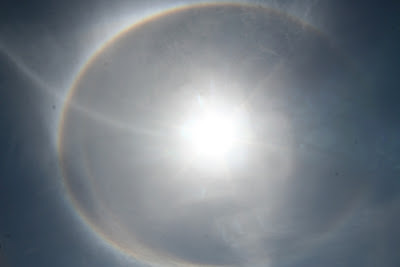 I trekked downstairs and there it was - a rainbow that circled the sun. Can anyone explain this phenomenon? You ask a question like this when you have access to the Internet? Tsk, tsk. thanks; when are you going to end your break from writing? Are you sure it was a rainbow? Rainbows never form a complete circle. Plus you need an intimation of rain to have a rainbow. Are you sure it wasn't just a 'sunset at noon' kinda thing? We saw this as well when we were leaving church sunday..my immediate thot was "I gots to find me an old man building and ark and BEG him to let me on". Forgive me Father...? Ah Fred... Should we be afraid (Very Afraid)? 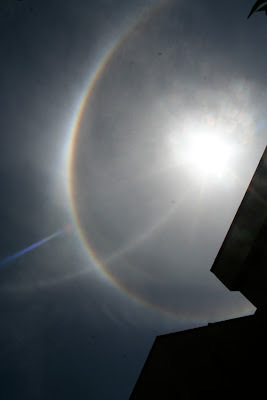 Is it natural for this halo (formed by ICE crystals) to appear in the tropics? There is no pot of gold at the end of this rainbow. Its round!! The cook, the feather, the photo, the truth..
Bibi, looking down at the kasbah.. The value of a head..
African docs at the Arcola later this month..
How to make a Chapmans..